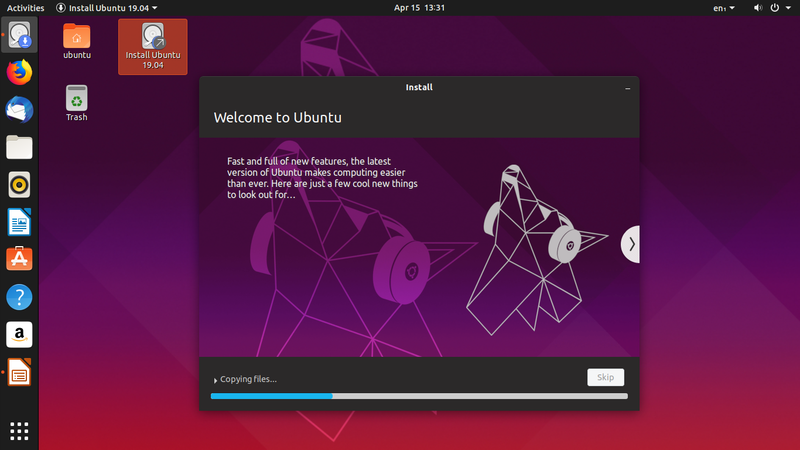 This tutorial explains how to install Ubuntu 19.04 "Disco Dingo" with or without UEFI and in internal or external hard disk drive. You even can practice this to install Ubuntu on USB Flash Drive. 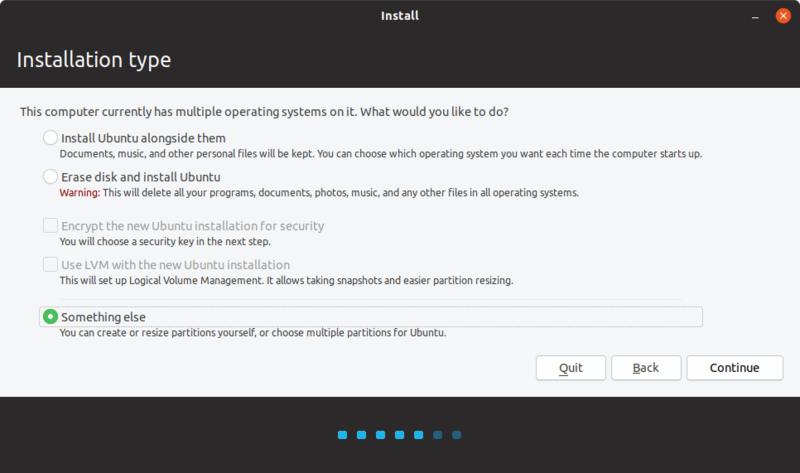 You will prepare 2 partitions, 1 USB Flash Drive as installation media, and 1 EFI partition (for computer with UEFI boot system). The installation is quick with only +/-15 minutes into flash drive and should be quicker on HDD and even more quicker on SSD. I wish you all success in your installation. Finally, good luck and happy working! Third, write the ISO image file of Ubuntu 19.04 into a USB Flash Disk using program Unetbootin (Windows), or GNOME Disk Utility (GNU/Linux), or Apple Disk Utility (MacOS). This tutorial is best for empty computer i.e. newly purchased computer or second hand without any data or any operating system inside. This tutorial can be used for dualboot installation mode e.g. having Windows and Ubuntu in one computer. 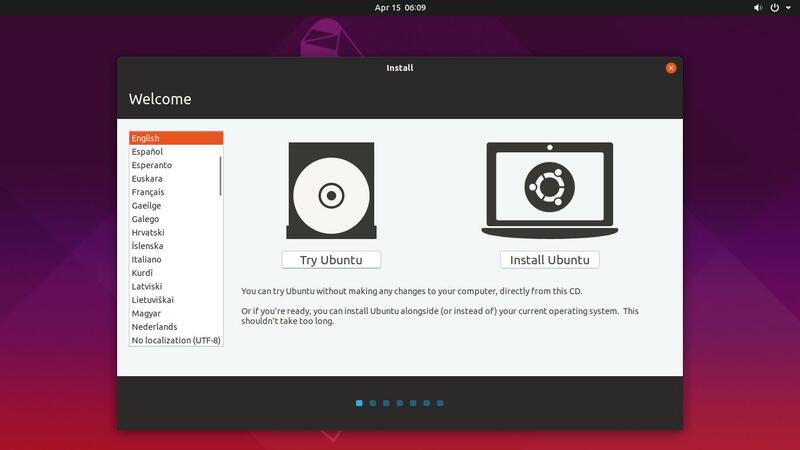 This tutorial can be applied normally to install Ubuntu into internal hard disk. 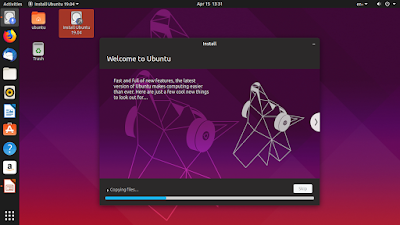 On the other hand, this tutorial can be applied as well to install Ubuntu into external hard disk drive or USB flash drive. You are responsible to your own computer and your own data. Make backup of all your important data present in the internal disk drive before doing any of these. Do not apply this to a non-empty computer e.g. dualboot mode unless you are experienced and you know what you are doing. If you are not experienced, ask technician or similar people with knowledge you trust near you to guide you in front of your computer to do these preparations and instructions below. Let him/her read the instructions and help you practicing. Plug your bootable drive into USB port. Boot your computer with USB as booting choice. 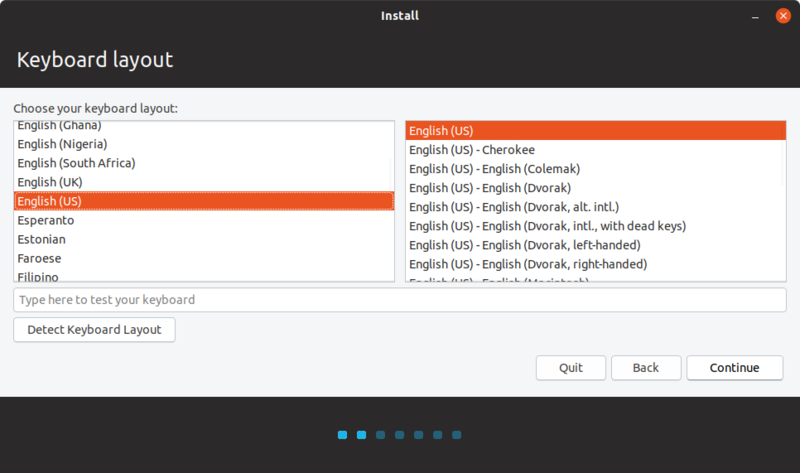 You should see Ubuntu screen soon with 2 choices. Click Try Ubuntu instead of Install Ubuntu. 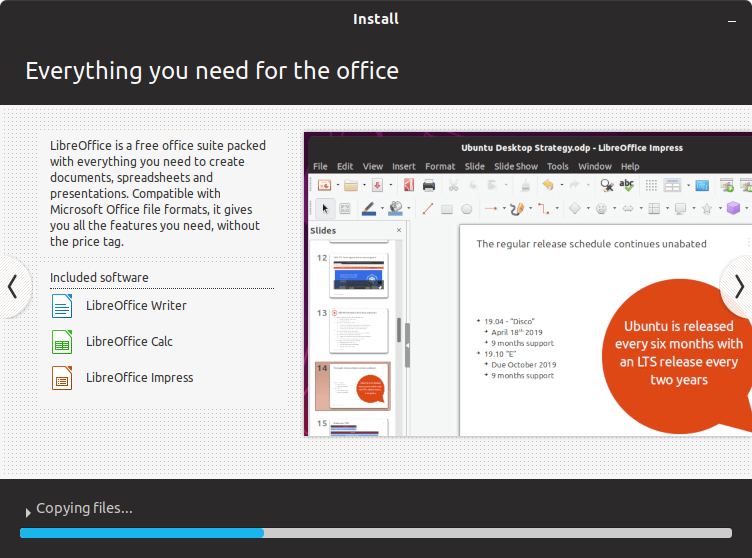 After that, you see a complete Ubuntu desktop ready on your screen. 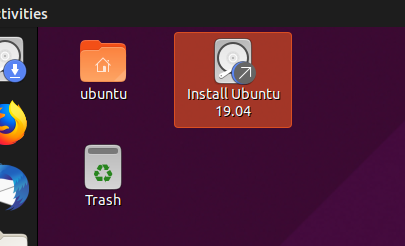 Double-click the Install Ubuntu icon on desktop. 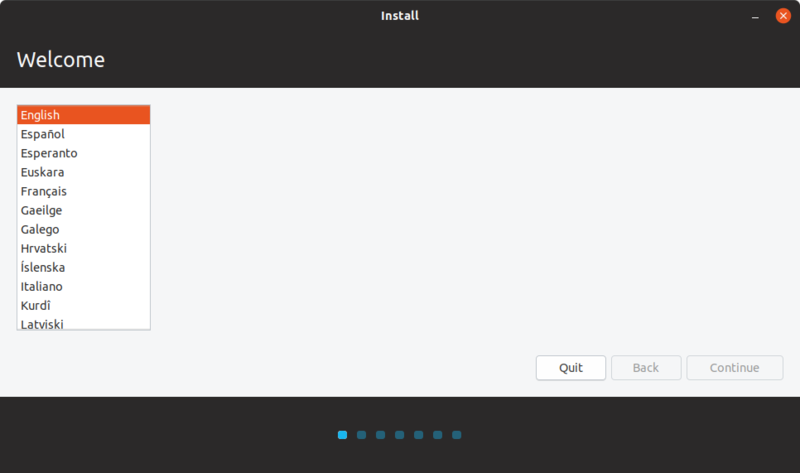 This starts Ubuntu System Installer. Let the default choice (English (US) - English (US)) selected unless you prefer another layout such as Russian or Japanese. Select I don't want to connect [...] instead. This way installation will finish faster. 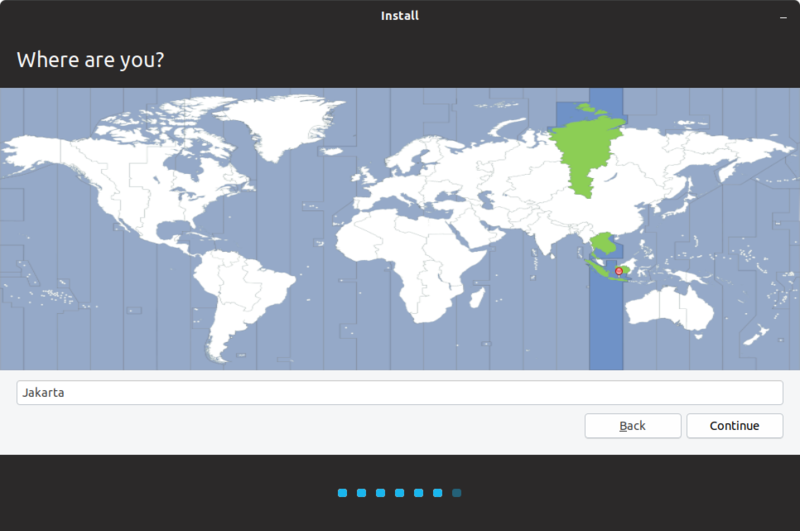 Let the default choice, Normal Installation, selected. 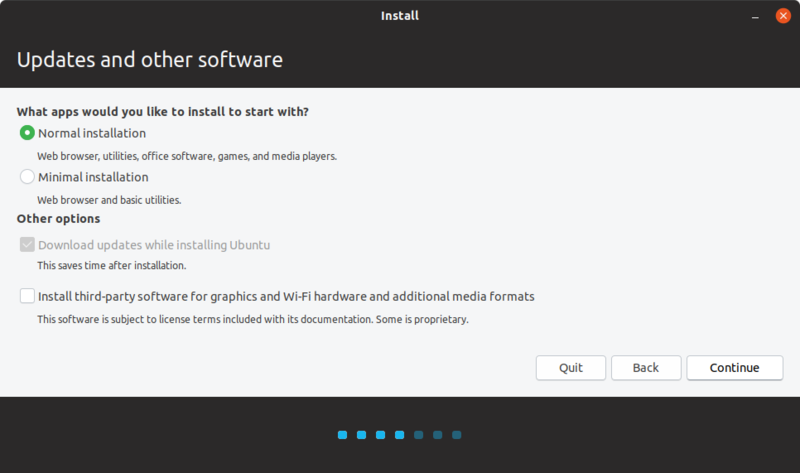 This will install everything Ubuntu comes with. Select Something Else. 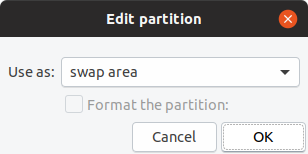 This will bring you partition editor. 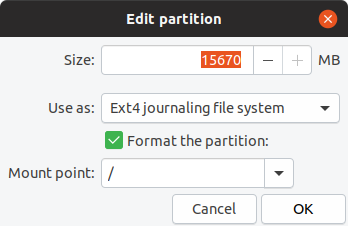 If you want to install Ubuntu into USB Flash Drive, I suggest you to use Ext2 instead of Ext4 as Ext2 write rate is lower. Only if your computer booting system is UEFI (new generation BIOS), follow this. If your computer still uses BIOS (Legacy) or has UEFI disabled, skip this right to step 8. Select your third blank partition of 500MB > click Change. Select Use as: EFI System Partition. Choose the hard disk location where your main partition located. For hard disk drive, for example, where your main partition is /dev/sda1, then the bootloader should be assigned to /dev/sda. 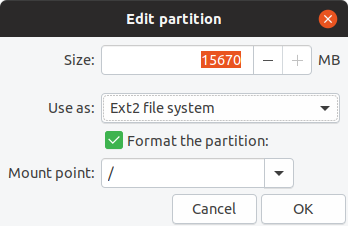 If you install Ubuntu to external hard drive, assume the partition is /dev/sdb1, then the bootloader should be in /dev/sdb. 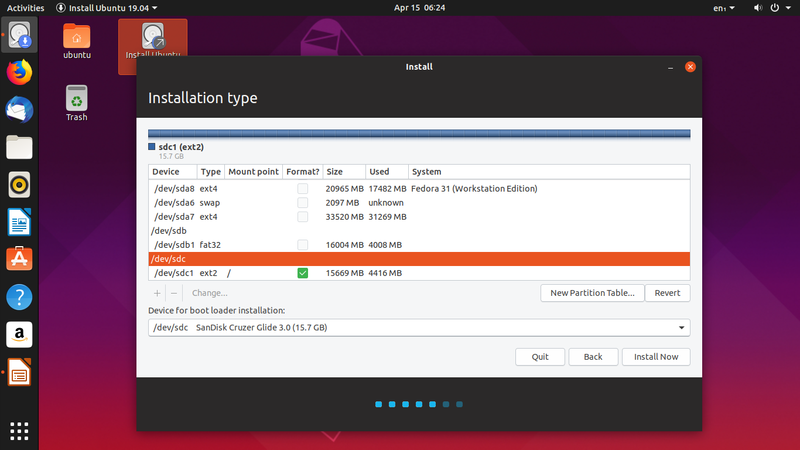 If you install Ubuntu to USB Flash Drive, assume the partition is /dev/sdc1, then the bootloader should be in /dev/sdc. Screenshot below depicts installation into USB flash drive /dev/sdc with partition /dev/sdc1 as main partition so the disk /dev/sdc is the bootloader location. Choose your country or country region. This determines your time, currency, number format (period or comma), and so on. Determine your own username and password. The password here will be your sudo password as well. What you need to do is to wait all remaining process to be done. In a laptop with Intel Pentium 4GB 16GB Flash Drive, this takes up to 14 minutes at most. 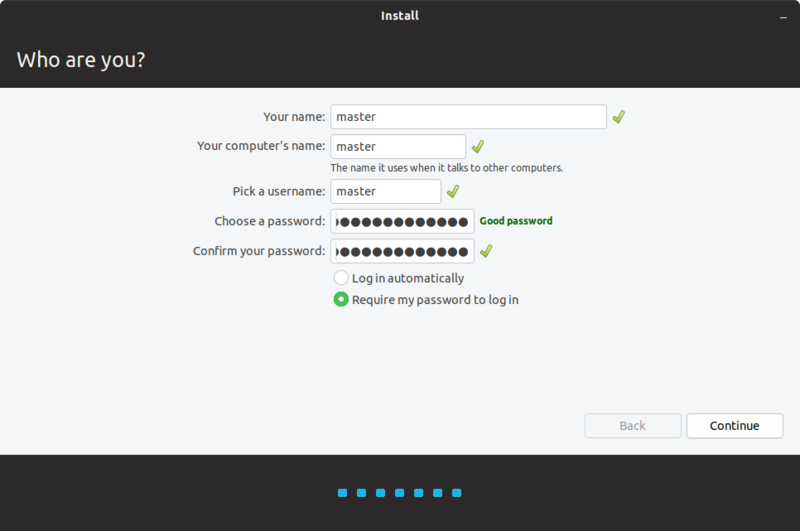 Once finished, the system installer shows Installation Complete dialog. 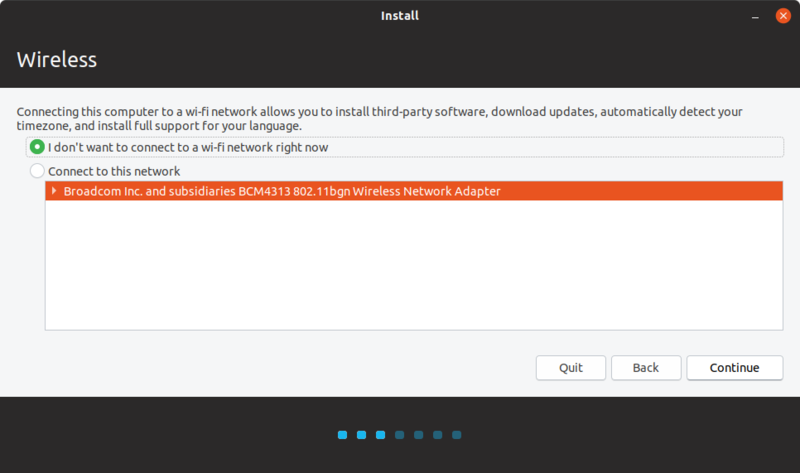 Click Restart Now, unplug your USB installation media, and let your computer boots to Ubuntu 19.04. Congratulations! Happy working!